Hey everyone! As usual, Lydia from Sekhmet's Purple Castle is back to do a guest post for our challenge! :) Enjoy! 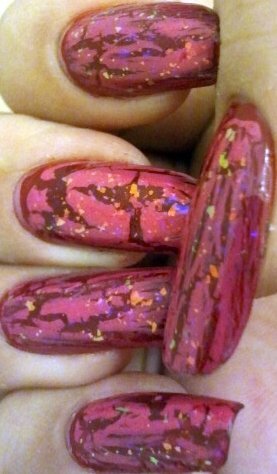 *Dont forget to visit her blog to see what I came up for Day 6: Pink & Red!! My beautiful friend Esme has allowed me to come back once again to share some pictures with you guys. 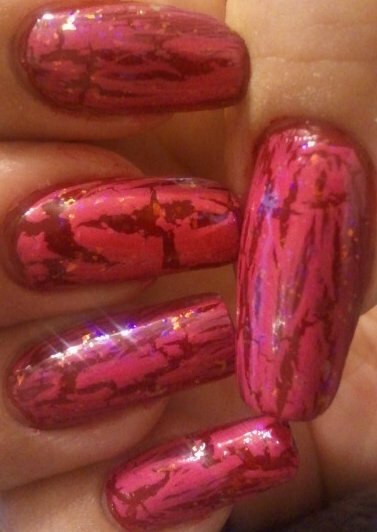 For today I have a pink and red manicure with some flakies action. Please remember to stick around we will be having 2 giveaways: one at my blog Sekhmet's Purple Castle and one here at Esme's blog pretty soon and you sure dont want to miss out. I hope you guys have a wonderful rest of the week. Oh! forgot to mention that this manicure was done before my nails had to be trimmed down due to a bad breakage. Dont forget to visit my blog Sekhmet's Purple Castle to see what Esme came up with for today.